Ask fellow campers about "Pineglen Motorcoach and RV Park" and nearby attractions. A nice quite park even though on a busy road. Wifi not so good. The Road out was into a very busy road so you have be patient. Easy to move about. We camped at Pineglen Motorcoach and RV Park in a Motorhome. The beaches are beautiful and not to busy. Schooners was great for a drink and a visit before sunset to watch the sun go down. An outstanding park. 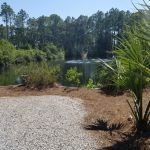 The landscaping is beautiful and you wind thru tall pines and around a couple of small lakes as you pass by sites that include bushes and other plantings. This is not your usual "put all the boxes in a row" RV parks. Reserving was easy. Check-in was easy and the lady at the front was polite and helpful. Granted, I'm new at this but this is the best park by far, so far. Not cheap, but value is there. There is WiFi with a couple of access points -- decent, better than average. We camped at Pineglen Motorcoach and RV Park in a Motorhome. Close to the beach. Go there. Ate at Sisters of the Sea last night and it was great. The spaces at the ends of the park are large, and open. In the middle of the park, they are a bit cramped. There are beautiful ponds (not sure what impact on mosquitoes that would have later in the year), an open field where it's common to see deer, and a nice "forest glen" feel in the park. It's very pretty. Our only complaint is the internet. They essentially have none. We used up all of our data on our plan and then some the month we spent there. You can just never get on the internet! The park hosts are super! We had a couple of pieces of mail delivered to the park, and they brought them to our doorstep! We camped at Pineglen Motorcoach and RV Park in a Fifth Wheel. Red Bar in Grayson Beach is a must do. A better value, and less famous is Hurricane Oyster Bar, also in Grayson Beach. The Hoffbrau Haus in Pier Park is fun, especially if you enjoy German bier. Fishale tavern is also a good place to get a good local bier. A brief 2 day/night stay while visiting relatives locally. Easy access of FL Hwy 98. Beautiful setting nested in pine trees with multiple lakes with overlooking sites to consider. Neat as a pin! Beautifully landscaped. Spotless clean. Gravel roads and sites but very level. Cable works great. Too many trees for Satellite service. Compared to other Florida campgrounds, this was an extremely high value. I would definitely stay here again. We camped at Pineglen Motorcoach and RV Park in a Motorhome. This RV park is located on a very busy stretch of road but once you enter the park you feel like you are in a secluded pine forest. This is not a destination park for young families but it is a very clean, quiet and relaxing RV park. Other than the pool and catch and release fishing there isn't much else to do here. The beautiful beaches and large variety of restaurants etc. are all very close. The camp sites are level but a little close. The gazebo that is on the pond is a relaxing place to sit and watch the turtles and other aquatic creatures in the pond. The screened in pool was clean and refreshing. The WIFI did not work well. The restrooms and showers were clean but the lighting in the men's room was very dim. I would recommend this RV park to anyone visiting the Panama City area. We camped at Pineglen Motorcoach and RV Park in a Motorhome. The sites are close, but the name says it all. This is indeed a pine glen. We would stay here again if in the area. It is quiet and comfortable; no road noise. We camped at Pineglen Motorcoach and RV Park in a Travel Trailer. We were happy with our stay at Pineglen. We would go back here again and camp! We camped at Pineglen Motorcoach and RV Park in a Motorhome. Park is gravel, spaces are tight, but adequate. No playground. Partial sun, pet friendly, restrooms were well appointed, handicapped accessible. Only one place to put trash. Somewhat overpriced compared to similar parks. We camped at Pineglen Motorcoach and RV Park in a Motorhome. We stayed here on an overnight in 2013 and were so impressed that when our son was stationed at nearby Tyndall AFB, this has become our go-to place to stay when visiting him, even though it is a 40 minute drive from the base. The owners keep the place looking great all the time. Longer term campers keep their sites neat and clean. The laundry room is great, restrooms and showers kept very clean. Even though the park is right next to a major highway, road noise is very minimal due to all the pine trees and other foliage. We camped at Pineglen Motorcoach and RV Park in a Fifth Wheel. The good= clean, well kept up, quietly nestled back from a busy road, wonderful onsite managers, gravel roads and sites, picnic table and cement pad at each site, very pretty, 3 little lakes, tall pine trees, big, green, dog area in back, one mile from pristine sandy beaches with good access, The bad=very cramped pull through sites, needed two boards for level, swimming pool very small, not heated, located in a mesh tent, little direct sun, cable has limited channels, not high definition, internet very slow and unreliable, frequently could not even get it, only three washers and dyers in laundry, always busy, drove 3 miles to do laundry, further for propane, too many trees to get satellite. Would have given this park a higher score, but for the price, (we paid ($860 for one month) we felt the amenities were not up to par. We camped at Pineglen Motorcoach and RV Park in a Fifth Wheel. This is a great, well taken care of, campground. We stayed here last February for a couple of days and were so impressed, we decided to stay two weeks this time. They do a great job keeping up with the ongoing maintenance for a park this size. It is located off HGWY 98, and is close, but not too close to PCB happenings. We got the $340.00 weekly rate (Peak Season) which we felt was reasonable considering the location. We definitely stay here again. If you think I errantly give good reviews, then check my other ones. We camped at Pineglen Motorcoach and RV Park in a Fifth Wheel. This is a nice clean park, close to everything and quiet at night even though it's off the main drag. The laundry room was clean, and all of the machines worked. The pool is caged so you don't have to worry about bugs when you use it, and the sites are shaded with lovely pine trees. We stayed here for 2 days and enjoyed our visit. We camped at Pineglen Motorcoach and RV Park in a Motorhome. Rate shown is with a 7 day stay. This is a really nice park with shade trees and plenty of room to relax. The sites are big rig friendly, too. The 3 ponds are very peaceful with gazebos nearby to just sit and enjoy the day. The staff was very nice and helpful with getting us settled into our spot. We had to drive a short distance to the beach but it was worth it to have the peace and quiet at night. We'll definitely be coming back here again! We camped at Pineglen Motorcoach and RV Park in a Travel Trailer. This is a very nice park not too far from the beaches. It has a beautiful covered pool area. The laundry was very nice. I did not use the restrooms. There were several people fishing in the lakes. There were mostly snowbirds in the park, but it was very clean and sites well manicured. We camped at Pineglen Motorcoach and RV Park in a Motorhome. Are you affiliated with Pineglen Motorcoach and RV Park ?